Aphids are sucking insects that build up to huge numbers on tender new shoots and leaves. A black stain known as “sooty mold” is a problem beneath infested trees. Boxelder aphids are light to dark olive-green, and 2 to 2.5 mm long. Wings, if present, are held above the body. They overwinter as eggs on the host plant. Nymphs hatch in spring and develop into wingless adult females that reproduce without mating and give birth to living young. Several wingless generations are produced during the summer. The final generation in the fall develops into winged male and female adults, which migrate to new host plants, mate, and produce eggs. These sap-feeding aphids cluster under leaves and along stems, and often secrete a sticky sugary substance (honeydew) that covers leaves, branches, and objects below the tree. Molds grow on this substance giving it a sooty appearance. Feeding discolors leaves, may cause premature leaf drop, and can decrease tree vigor. Damaged leaves are yellowish with brown stippling. Black willow aphids are relatively large aphids, 3 to 4 mm in length, that have black bodies and orange tube-like projections (cornicles) extending from the rear of the abdomen. They are found in groups on bark where they feed on sap. The life cycle is similar to that of the boxelder aphid with several generations remaining on the same host plant. Adults can be found throughout the summer and fall, but they are most abundant during August and September. Large aphid populations cause premature leaf drop and reduce tree growth. Woolly elm aphids are green to dusky gray; woolly apple aphids are yellowish to rusty brown. Mature aphids are 1.5 to 2.0 mm in length. This variety of aphids overwinter as eggs that are laid in bark crevices in late fall. In spring, wingless females hatch from the eggs and migrate to newly expanding leaves, where they feed and give birth to live aphids. 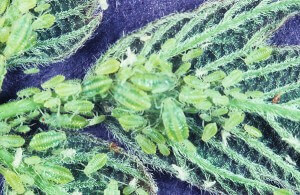 Up to 200 winged and wingless aphids may be produced by one female. The winged offspring migrate to new leaves, while the wingless offspring feed on the same leaf. 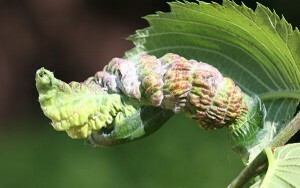 Feeding by nymph and adult aphids causes young elm leaves to swell, fold, and curl around the aphid colonies.